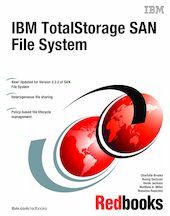 This IBM Redbooks publication is a detailed technical guide to the IBM TotalStorage SAN File System. SAN File System is a robust, scalable, and secure network-based file system designed to provide near-local file system performance, file aggregation, and data sharing services in an open environment. SAN File System helps lower the cost of storage management and enhance productivity by providing centralized management, higher storage utilization, and shared access by clients to large amounts of storage. We describe the design and features of SAN File System, as well as how to plan for, install, configure, administer, and protect it. This book is for all who want to understand, install, configure, and administer SAN File System. It is assumed the reader has basic knowledge of storage and SAN technologies.